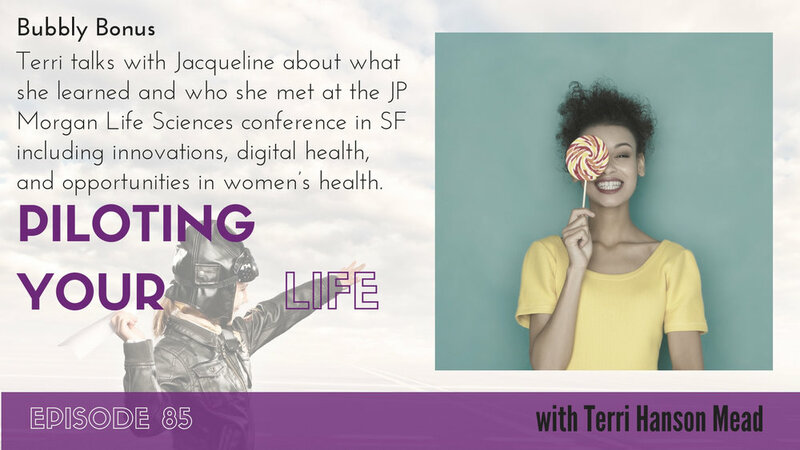 Terri talks with Jacqueline about her revised vision for Piloting Your Life the podcast in 2019 to focus on the blue ocean opportunities in women’s health. 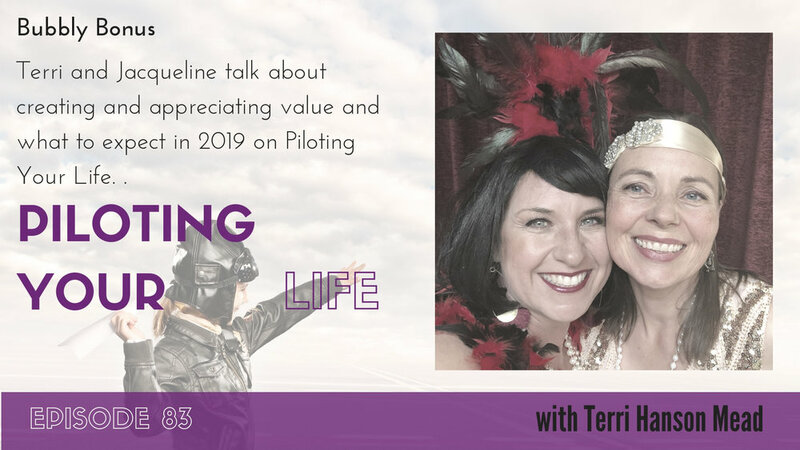 They also talk about why they are optimistic about 2019 and how they see midlife not as a crisis but as a beautiful time for exploration and growth as Terri shares more about the research she is doing for Piloting Your Life the book. Terri talks about changing up the podcast for the first part of 2019 to focus on women’s health (FemTech). Terri shares why she has hope and optimism for women in 2019. Terri and Jacqueline expand on the opportunities in women’s health and the importance of focusing on health and body and environment holistically. Terri and Jacqueline talk about what they are excited about in 2019. Give yourself permission to choose to add more joy into your life. Terri and Jacqueline wrap up 2018 with a final bubbly bonus where they talk about value, creating win-win situations and not giving away so much for free. They discuss trends in the startup ecosystem including electric scooters, unrealistic valuations, and antsy investors. Finally, they share the plans for Piloting Your Life in 2019. Terri and Jacqueline talk about value and creating win-win situations. It’s important for every woman to know her value. Terri talks about how she is planning to operate as an angel investor in 2019. Terri shares why she is doing the podcast and what to expect through the rest of the 2018/2019 year and what she is planning to ask the investors she is interviewing. Jacqueline asks if shows like Shark Tank and The Pitch create unrealistic expectations for people who start businesses or have an idea. Terri wonders what 2019 will look like with the state of the economy and startup investing and investors getting antsy for exits for the companies that have had unrealistically high valuations. Terri argues for additional funding for women’s health instead of funding electric scooters. Terri and Jacqueline brainstorm questions for Piloting Your Life interviewees for 2019 and ask listeners to share some of their questions. 2018 was a strange roller coaster of a year and expects 2019 to be another wild ride.